The Windham Eagle Real Estate: Should I sell my home now or wait until spring? There are many questions homeowners ask themselves during the selling process. "How much will my home sell for?" "How much should I list my home for?" "Who should I select as a real estate agent to sell my home?" Lastly, "Is this a good time to be selling a home?" is also a very common question that real estate agents are asked. As with every decision in life, there are pros and cons, and choosing when to sell a home is no different. Many homeowners believe selling a home during the fall or winter months is not a good idea and that the spring is the only time a house should be sold. This is the furthest from the truth. There is no doubt that the "spring market" is a great time to be selling and buying real estate, however, the fall and winter seasons may be the best fit for you for several reasons. One great reason to sell your home now and not wait until the spring market is there is sure to be less competition. Simply put, it’s the supply and demand theory. If there are less homes for sale, there are less homes that a potential buyer can choose from, therefore increasing the demand for your home. Not only will less competition increase the probability for showings, but it will also increase the probability that an offer will be received, and you will get the maximum amount of money for your home. Many homeowners believe that buyers aren't out there during the fall and winter months. This simply is not the case. Serious buyers are always out there! Some buyers may stop their home search because it is the fall or winter, but serious buyers will continue to look at homes, no matter what time of year it is. Do your neighbors have pumpkins on their front step? Are there lots of Trick-or-Treaters wandering the neighborhood on Halloween? Do any of your neighbors have any light displays for the holidays? There are buyers out there who will look at these types of things when determining whether your home is in the right neighborhood for them or not. The best agents are always up for the challenge. Any real estate agent who tells you that the fall or winter months are a bad time to sell is not someone you want selling your home. A great real estate agent will know how to adapt to the current season and market their listings to reflect that. Right now, there are fewer real estate transactions than there will be in the spring. The fewer number of transactions means the mortgage lenders have less loans to process, title companies have fewer closings to do and home inspectors have fewer inspections. All these factors should lead to a quicker transaction and less stress for you. 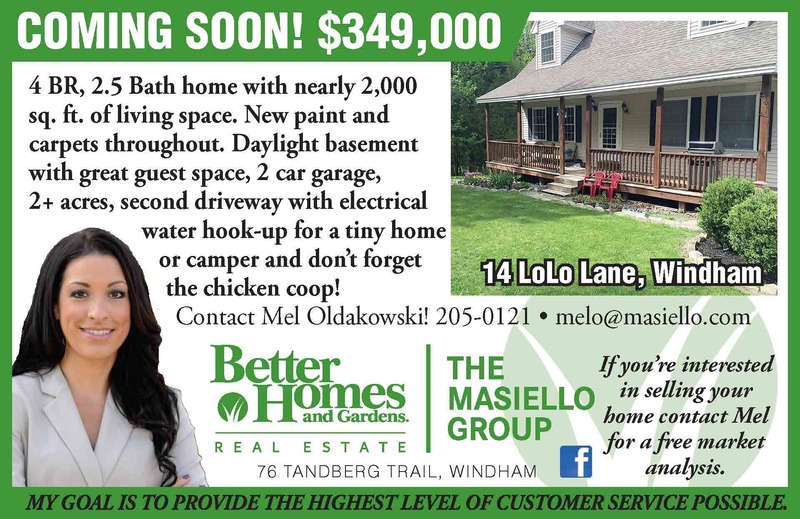 This article was brought to you by Mel Oldakowski of Better Homes and Gardens/The Masiello Group in Windham. She can be reached at 207-205-0121.